Kill Audio: Hot Topic Kill Audio Signing and Release Event! Hot Topic Kill Audio Signing and Release Event! Hot Topic has announced their release of the KA figure. 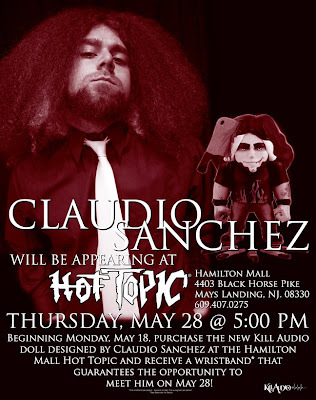 If you purchase a figure from the Hamilton Mall Hot Topic, you will receive a wristband for his meet and greet on May 28! My name is Guacira, I'm Brazilian. I am fan of Coheed and Cambria, and Amory Wars. I was delighted with Neverender, I really want to buy it. There is only one problem the shops that sell not deliver internationally in Brazil, and when delivered to the customs rate is almost 60% of the purchase. Enjoy and come to Brazil to do a show. Chicken Coke Daddy spotted on local farm.